This second card was a make-and-take completed at a home workshop. We used another stamp from the Watercolor Trio, colored the stamp with Only Orange, Chocolate Chip and Old Olive Stampin’ Write markers and again misted the image with water before stamping. We stamped the images so they appear to be in our Brocade Blue vase. The vase was punched with the ornament punch, embossed with the great new Square Lattice Embossing Folder, and trimmed to give the vase appearance. Two little butterflies cut from the Stampin’ Up Beautiful Wings Die and some Only Orange grosgrain ribbon completed the picture. This card uses all 3 stem images from the Watercolor Trio. I stamped the middle leafy stem in Old olive, The stem to the right was colored with Old Olive and Pixie Pink Stampin’ Up Markers. The stem to the used Garden Green, Only Orange and Chocolate Stampin’ Up markers. 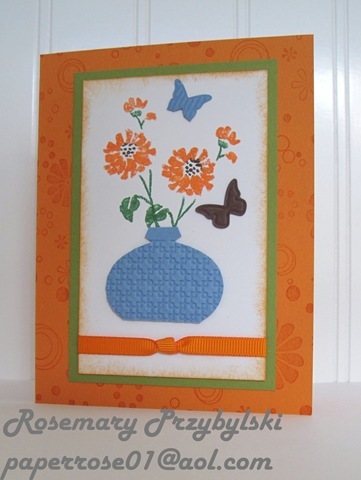 I duplicated the Brocade Blue vase, the butterflies and the orange ribbon as I did on the second card. 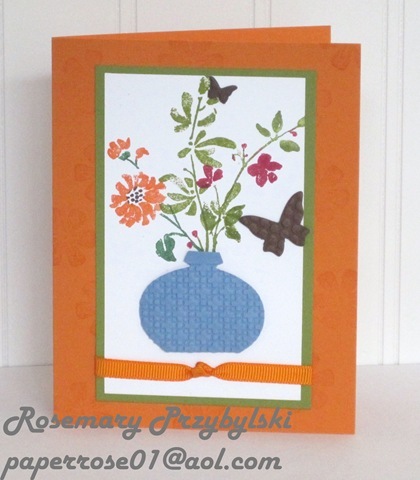 The soft flowers sprouting from the vase are pleasing to the eye and produce a great card for a favorite friend.